Clare is not a Smurf! 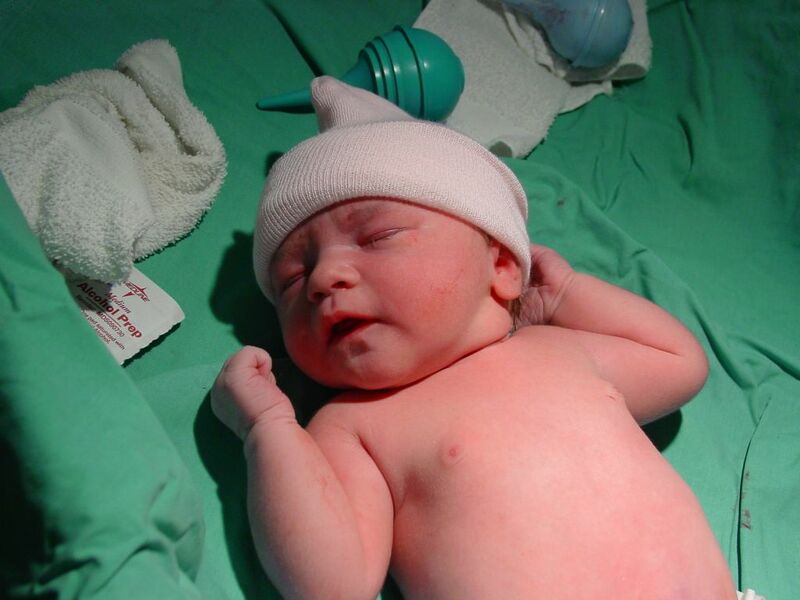 After being nine days past our estimated due date, Lana went into the hospital to be induced. 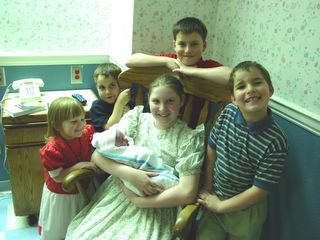 We were due to arrive at the hospital at 7:00am, so David had organized to wake up at 6:00 am. Unfortunately, he looked at the Australian time on his watch and didn’t adjust properly so we awoke at 4:00am! Lana was very gracious and didn’t hit David. From the time we began at about 7:30am Lana’s contractions slowly increased. Eventually at 5:15pm Rose graced us with her presence. We were very impressed with Doctor Karisny and the local Union County General Hospital. After our experience with the emergency ward we were expecting the worst. As it was, all of the labour ward staff were great and greatly helped us during the day. When Lana’s Mum and Dad and the children arrived about an hour later, David received the message that the family had arrived. He went out and couldn’t find them. He came back, and then went back out and asked at the nurse’s station, “Hello. The rest of my family has arrived. Any idea where they are?” From his accent, they knew exactly who he was talking about and answered, “They are in Lana’s room.” “Aha,” replied David, “But we’re not. We’re in the Labour ward.” And went off to collect them. It was great seeing all the nurses stand up and watch as David, the five children and Lana’s Mum and Dad all trooped off to see the new addition. We had originally planned to have Rose baptized on mid June. However, with her arriving later than expected, we deferred the baptism to the end of June. 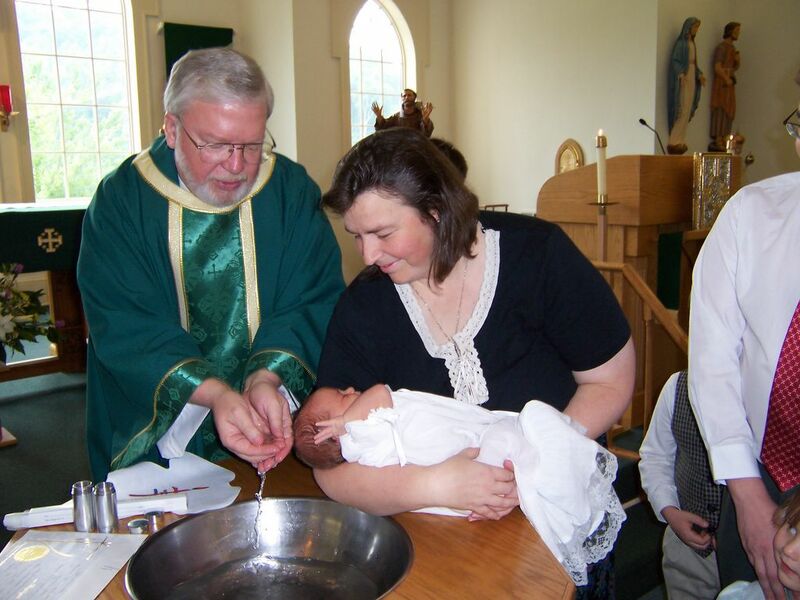 The Baptism was part of Mass so all the parish could participate. 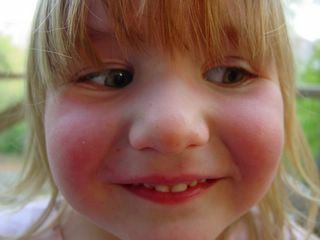 It feels as though Rose now has about 50 new grandparents in addition to the standard four. As Jesus told Nicodemus, “Believe me, no man can enter the Kingdom of God unless birth comes to him from water, and from the Holy Spirit.” [John 3:5] So now, Rose is part of the community, a Christian, and “de-paganized” as Father Wise quipped. Despite the importance of the occasion, Rose slept through the whole thing, even when the water was poured on he head, and the christening oils were applied to her forehead, ears and lips. Now, if only she would sleep through the night! 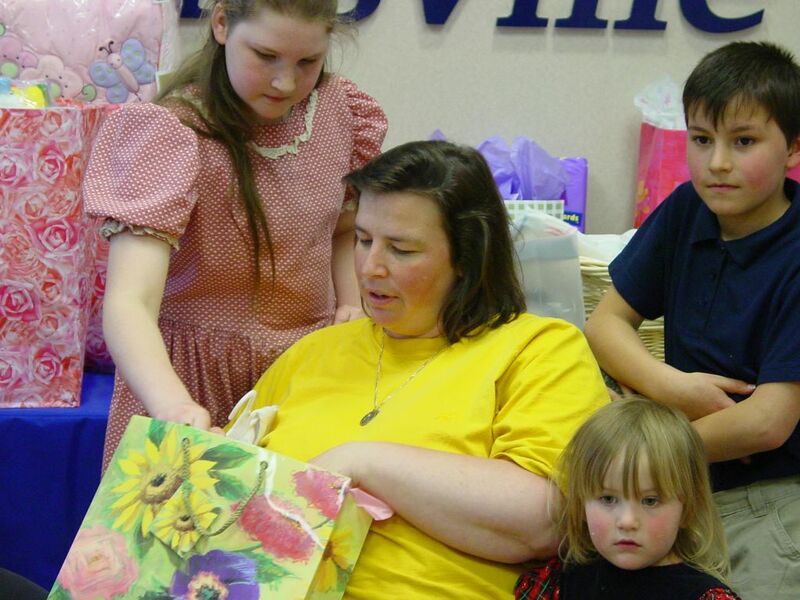 We were able to experience a most extraordinary tradition common hereabouts known as the “Baby Shower”. This is where a collection of women organize and attend a party for the expectant mum, and shower her with various gifts to help with the upcoming new baby. There is a cake, some games, and lots of “Oohs” and “Aahs” as the presents are opened. One of our initial concerns with Rose was that we had not brought ANY baby related things with us. With only a limited number of suitcases, we only brought what we thought we would be using in the short term. The Baby Shower that was organized for Lana was more of a “Baby Flood”; the generosity of those ladies was incredible. After looking over all the presents, we worked out we need to buy nothing to get ready for Rose. Of course, now the challenge is to make sure Rose is able to wear all the clothes before she grows out of them! You may remember us mentioning the flying fox that James had built in September last year. Well, with Lana’s father here, we have improved it a bit. The problem with the earlier one is that it used the cubby house and a small tree as the two posts. This meant if Eric used it, both the tree bent and the cubby house wobbled. The new, improved flying fox goes from one huge tree behind the cubby house to another tree diagonally opposite, with the rope going through the cubby house. Also, we found a great pulley that made it roll very well. David and Dad set it up and then had Ariel and Eric test it. Unfortunately, Ariel was too heavy and skidded along the ground and smashed into the tree. Ooof! So, plan B. 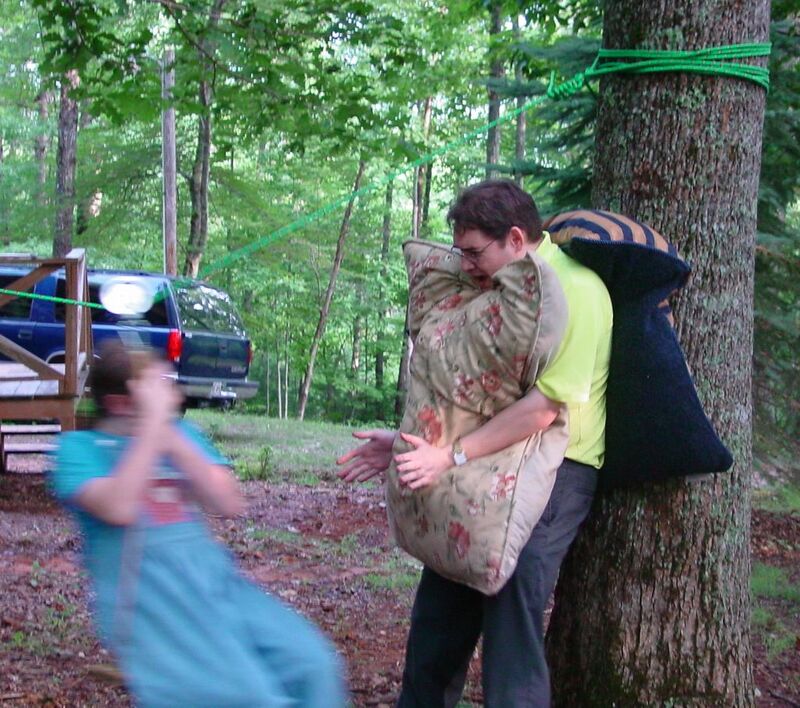 They tied the rope higher onto the base tree, which decreased the angle and rate of descent. Also, by the time the rider reached the tree, they would be going up hill and be slowed down. But Ariel wouldn’t try that dangerous thing again! (Wise girl). So David had a great idea. He had a large cushion between him and the tree and another in front. 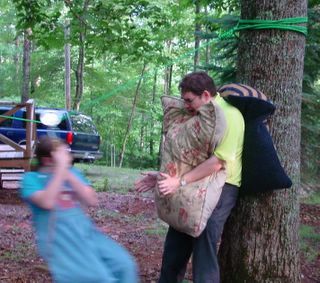 Then Ariel had a go, knowing David would catch her. Does he look worried to you? Danger! Danger! Danger! - Would Steve Irwin try this? 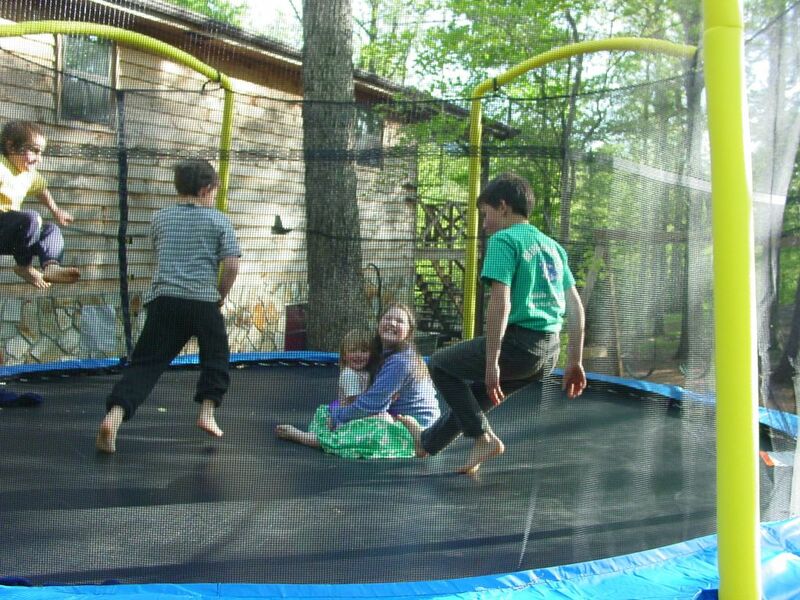 To help Lana with the home-schooling, we purchased a trampoline for the children. This allows Lana to tell a fidgety child, “Go outside and jump on the trampoline!” After a bit of exercise, they are ready for some more study! 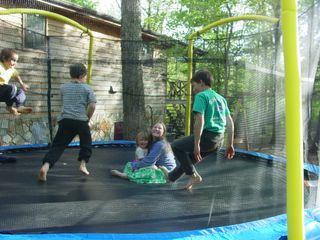 Unlike the trampolines we had at home, the typical ones here are round and can come with safety netting. We purchased the 15’ diameter trampoline. It came with good quality padding that completely covered the springs. With the net in place, the whole trampoline gets used. 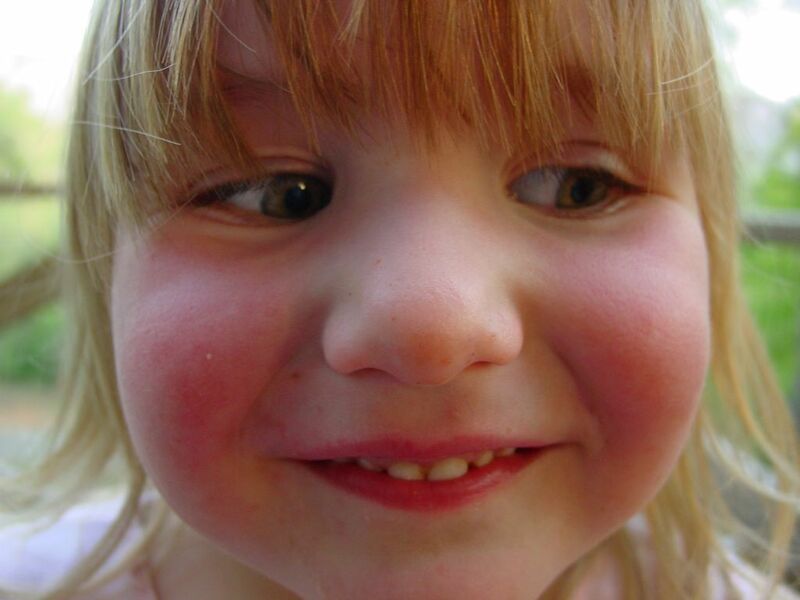 A timer allows the children to take 5-minute turns without too much squabbling. All of the children testing out how the trampoline bounces. We have discovered a number of excellent resources that are great value – and they are free. This weekly email provides a 30-minute radio show from the 50’s. These shows are a wide variety from “Adventures in Research”, “Lassie”, “Family Classics” and others. You just download them and play. You can also order complete MP3 CDs with lots of shows and audio books. The cost for these CDs are USD $19.95 which includes postage to US or Australia. We recently purchased the “Adventures in Listening” CD and have learnt about “The first skyscraper”, “Million Dollar Cabbages”, “Buring Rocks”[How oil shale was discovered], How ice cream was invented, outboard motors, and so on. Check out the latest here. The best MP3 organizer is iTunes for both the Mac and Windows. It doesn’t cost anything, but organizes your music files very well, obtains tracks from CDs and writes your selected tracks to blank CDs. We have converted all of our music to MP3 or AAC (Apple’s music format) from CD, record and cassette. This is then organized by author, genre, album and other attributes, as well as creating multiple play lists – one for each family member. Robert Krampf provides a weekly science experiment by email. Each experiment uses typical household items and the scientific principles are explained in layman’s terms and some humour. Amongst the more recent experiments, we have looked at balance, cracking knuckles, floating, caramel colour, weights and scales and lots more. Dover publishes and distributes a wide variety of fine books and materials, especially those aimed at children. They have one of the largest collections of topical colouring books I have seen. In order to show people how much they have, they send a weekly sampler which links to a page containing a sample of a selection from each of this week’s books. Each Friday we go to the Sampler page and save a picture of each of the samples into a folder. We now have a great variety of colouring-in pages, mazes, cross words, find-a-words, logic puzzles and more. Ariel was able to create a customized activity book for some of her friends using a collection of the pictures. Also, we bought some of their colouring-in books and were very happy with them. They all had fun using the King Arthur book. This is the most recent sampler. We have had rain lately. Lots of Rain. Lots and lots of rain. In fact, I think that since Lana’s parents arrived we have had more rain days than completely clear ones. Father Wise commented last week that there is fine weather just a mile from here – a mile straight up that is. He also commented that if anyone spots a large yellow thing in the sky, they are not to panic. It is not the end of the world, that thing is called “The Sun”. Meanwhile in Australia, almost every capital city has water restrictions, water catchment areas are closely monitored and the local fire brigades are worried about the coming bush fire season. In fact, they are even worried about the possibility of fires going out of control in zero temperature (32F) from hazard reduction burnings when windy. It is very dry. So, you can imagine my surprise at the local paper’s headlines, “No Drought. Water Restrictions.” Drought? Apparently there is some sort of “drought” in some part of the State, but not around here. Here the ground squelches underfoot, and the flora grows whilst you watch. In July last year we pictured a moth, and asked what type it was. This time we were prepared. We have a collection of “Peterson First Guides” which are great little insect, bird and flora spotting guides. This time when the huge moth fluttered by, David went outside and caught it. 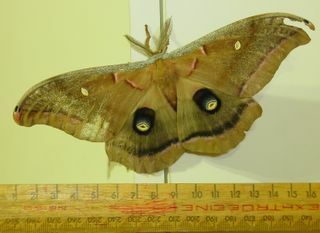 It is a “Polyphemus” moth, named after a one eyed giant in Greek mythology. They grow up to 6 inches, and as you can see this one is close to the largest. It appears that some local small birds like to build nests in the support rafters of our outside decking. The children thought this was all pretty good. They could hear the baby birds chirping and then see the mother bird swoop under the deck and go into the nest, feeding them. But, one Sunday, the birds had grown too big and the nest fell to the ground. But the baby birds were still too small to fly. 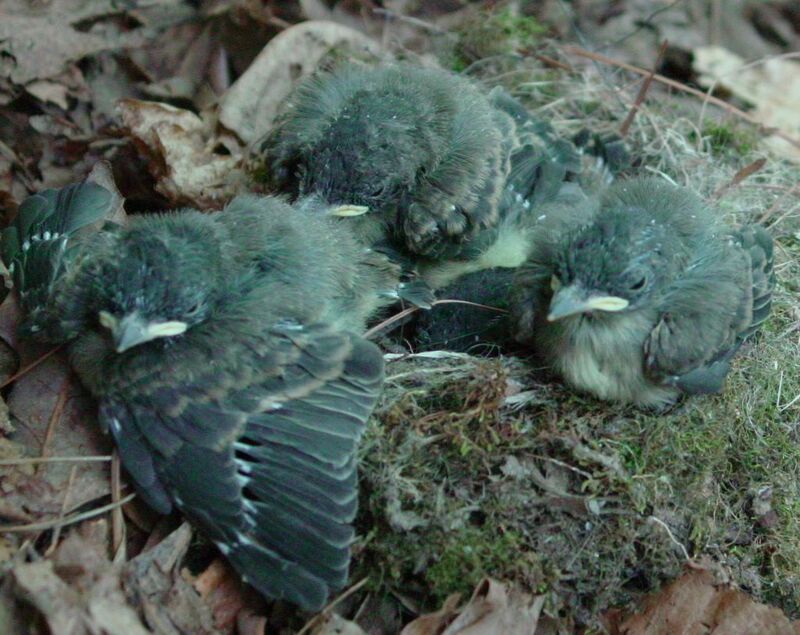 The children gathered them up and put them in what was left of the nest. We had to go to Mass and we told the children we would see what we could do later. Upon returning, two of the five birds had waddled off. James and Clare found them and put them back in the nest. David did some research on the Internet and found out that the best way to save the baby birds was to put up another nest near the first. The best we could do was to hang up a brightly coloured Easter basket from a hook screwed into the rafters. The old bird nest plus more stuffing was placed in the basket, and the baby birds placed in it. We then stood back and waited. Next day we heard the birds chirping and the children saw the mother bird fly into the new nest! Great! The children’s handling of the baby birds did not stop the mother from feeding them. Is this a big beetle or what? 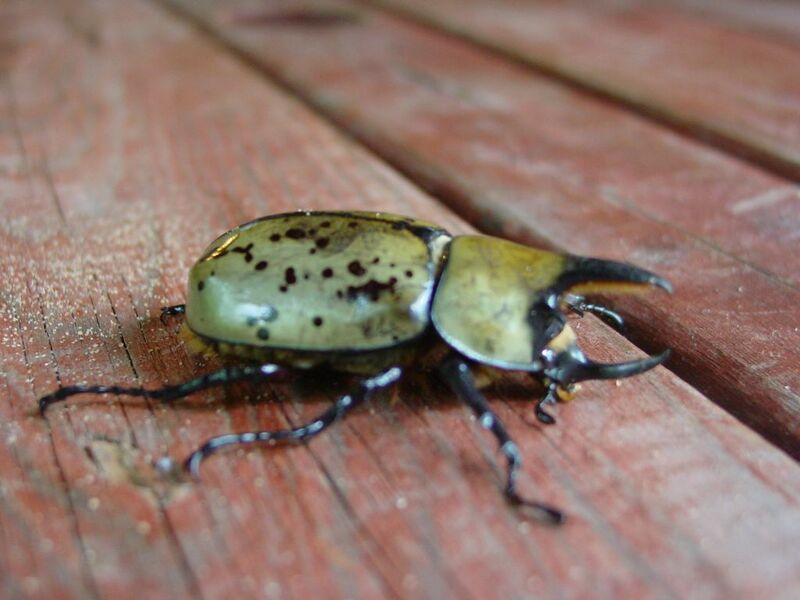 Jonathan Floyd visited and showed us his latest prize – a Rhinoceros beetle. In showing us this huge beetle, we also discovered it defense – its odour. Phew! Big Beetle - big smell.